Bathrooms are the biggest household water guzzlers—accounting for more than one half of a family’s indoor water use, according to the U.S. Environmental Protection Agency (EPA). 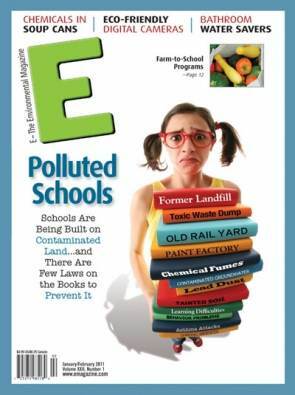 All that soaking, showering, flushing and brushing adds up—and harms the environment by draining aquifers and unloading tons of wastewater into sewer or septic systems. The first step to saving water in the bathroom is to fix any faucets or fixtures that leak. A leaky toilet that’s constantly “running” can waste 200 gallons of water per day, the EPA notes. In fact toilets, not showers, are a home’s largest water user—flushing away nearly 30% of the water in an average home. After fixing the leaks, make a simple switch: “One of the easiest things to do is change the aerators on your faucets,” says Scott Frad-enburg, sales manager for Green Depot, which sells green home supplies. An aerating sink faucet costs about $2 and can be installed in minutes. The tiny screw caps add air to the water, slowing the flow without noticeably impacting water pressure. When considering new fixtures, look for the WaterSense label, an EPA consumer confidence designation that certifies faucets, toilets and showerheads that are 20% more efficient—and equal to or better in quality—than average products. Older toilets installed before 1980 likely use from five to seven gallons of water per flush; models from between the ’80s and early ’90s use about three-and-a-half gallons per flush. Newer, more water-efficient standard models use about 1.6 gallons (or less). Other eco-options include dual-flush toilets and compost toilets. Dual-flush toilets give users a super-low-flow option (about a gallon of water) for urine-only flushes and a second flusher for number twos. They range from $500 to $800 and are available from the companies Kohler and Caroma. 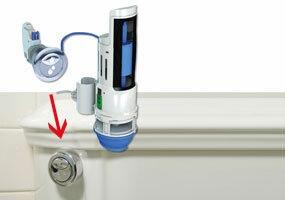 But any old toilet can be converted to a dual-flush rather inexpensively using a system such as the HydroRight Drop-In Dual Flush Converter ($24.95; eartheasy.com), which works with all standard flush valves. Once installed, the unit replaces your flusher with a two-way up-or-down button. Composting toilet systems, which average $1,500 or more, use the least amount of water and biodegrade waste on-site. Some composting toilets use no water and simply let gravity pull waste down to a compost receptacle beneath the house; others use a little water to wash waste into the composting component. The composter evaporates wastewater and mixes in aerobic microbes. Though some people love the blast of high-pressured water or the oversized “rain” style showerheads that guzzle by the gallon, eco-conscious homeowners will want to minimize the torrential downpour. New federal regulations mandate that showerhead flow rates must remain under 2.5 gallons per minute. Shop around, and you’ll find showerheads that flow at 1.75 gallons per minute or less. Much water is wasted when we wait for our shower to warm up. Consider installing a showerhead with “showerstart” technology from Evolve ($69.95 for a rain shower with pulsating spray). After you turn on the shower, the cold water flows out normally until the water reaches bathing temperatures—95°F—and then it slows to a trickle. You flip a switch or pull a cord to get the full flow going when you step into the shower. Reuse grey water from hand-washing by replacing the lid of your toilet tank with a sink-lid. Sink Positive (about $100, by Environmental Designworks) sits on top of the toilet tank and draws the cold, pristine water through the faucet for hand-washing. Then, used grey water is drained into the tank for flushing. In this way, hand-washing doesn’t require extra water. Water flows automatically with the fresh water refill cycle after each flush, so you need not touch handles or knobs with dirty hands. You can also consider a smaller-sized sink. Caroma sells sinks that have smaller capacities. “The bowl size is 2.5 liters and that limits someone filling up a sink with water that they don’t need,” Fradenburg says. CONTACTS: EPA’s WaterSense Program; Caroma; Envirolet; Green Depot; SinkPositive.